Dear Friends Are you looking for the ECIL Hyderabad Jobs 2017? Then, here is the recent job notification which is ECIL Tradesman Recruitment 2018. In order to get the detailed information, you need to stay here on this page. 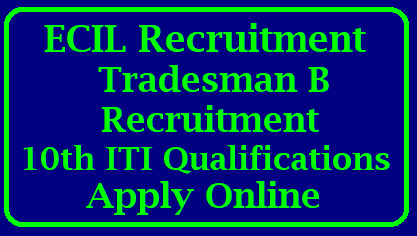 First of all, we suggest every aspirant to download the ECIL Tradesman B Notification. Actually, the officials announced 40 vacancies for Tradesman jobs. Instead of searching for the details here and there, it is quite better to know from the official portal ecil.co.in. Similarly, this page also provides you the genuine information. All the candidates who are waiting for the 10th pass jobs can immediately make use of this ECIL Tradesman Vacancies. Moreover, apply online link is active from 20th Dec 2017 and the last date to submit the application forms are 05th Jan 2018. Further details can be obtained from Advt. No. 38/2017 available at official portal ecil.co.in. In order to avoid the rush in last minute, complete your ECIL Tradesman Jobs Apply Online process as soon as possible without delay. With this in mind, we have furnished the direct links on this page at the end. Even though there are few vacancies, but the competition for this ECIL Tradesman B Notification is high. So, while filling the application form, check the details properly. Otherwise, you are no longer will be a participant in this ECIL Tradesman Recruitment 2018. Similarly, the authorities will concentrate on the aspects particularly like education, age limit, and other aspects. Especially, the candidates seeking for the latest 10th Pass govt jobs have to make use of this notification. In addition candidates, who are not so exact about the process of how to apply, can refer the steps given below in detail. ”. The on-line application process will be operational from 20.12.2017 (1400 hrs.) to 05.01.2018 (1600 hrs. ).